This week we launched the second annual 10 Minute shake up campaign, in partnership with Disney, which aims to get children more active. To coincide with the campaign launch we published an evidence review which points to strong evidence that participation in physical activity and sport has a positive impact on children’s social skills and self-esteem. The evidence review also identified further social benefits for children as a result of physical activity including increased confidence and peer acceptance, alongside a link to friendship. @ProfKevinFenton explained the thinking behind the campaign in a new blog and the launch also included an interactive video routine for schools, featuring Ricky Wilson of Kaiser Chiefs and The Voice. Violence is a public health issue. Sue Ibbotson from PHE West Midlands blogged to discuss how we have linked up with West Midlands Police and the West Midlands Police and Crime Commissioner to introduce the West Midlands Violence Prevention Alliance. With NHS England, we’ve launched an initiative which aims to put health at the heart of neighbourhoods and towns across the country. It will help communities “design in” health into new affordable housing from the outset. The Public Health System Stakeholder Forum: 'Getting serious about prevention' is a must-attend event for those leading the way in improving public health outcomes and preventing poor health. It takes place on 16 July in London. We’ve published an Introductory guide to the evaluation of weight management, physical activity and dietary interventions . It provides a useful first step for anyone new to the topic of evaluation or those wishing to refresh their knowledge of evaluation approaches. The warm weather was a hot topic this week and we highlighted actions which could protect those most at risk from heat related harm. 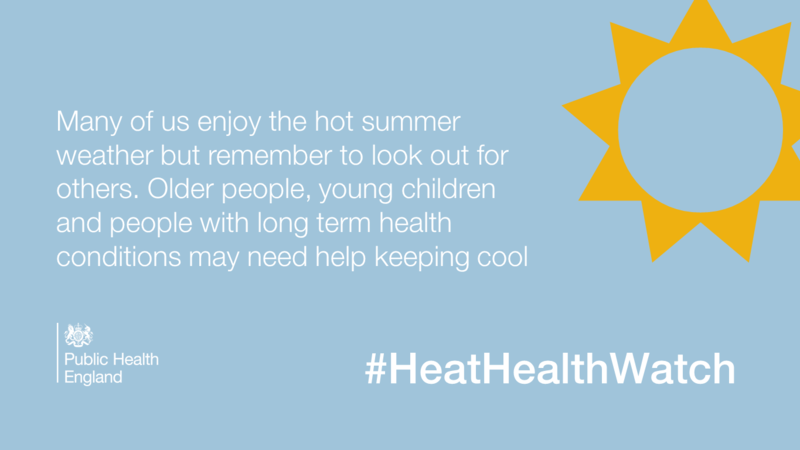 We blogged recently about why PHE plans for heatwaves.